WASHINGTON - Jenna Bush wants to clear up this pregnancy nonsense right now. The president's daughter is installed in a meeting room at the Hay-Adams Hotel. She has agreed to sit for her first-ever extended newspaper interview to talk about "Ana's Story: A Journey of Hope," her new book for young adults. The book is a nonfiction account of the struggles and triumphs of a Latin American teenager born HIV-positive. During a conversation lasting almost an hour and a half, she fields queries about topics as varied as her wedding plans ("We're thinking about a Las Vegas wedding! I'm just kidding!") and her thoughts on the war in Iraq. She hasn't seen all those blog entries speculating about when the Bad Blonde Twin is going to have her baby? "I'm not pregnant," she deadpans, then throws her head back and laughs. Her voice is husky and lacks the anticipated Texas twang. She looks straight at you when she talks, and her words spill out thick and fast. After graduating from the University of Texas and a stint on the 2004 campaign trail, Bush got a teaching-assistant position at the Elsie Whitlow Stokes charter school in Washington's Mount Pleasant neighborhood. The next year she had her teacher's certification and a job coteaching a third-grade class. "Many of my kids emigrated from El Salvador, Peru, Mexico, all over this region," she says. She didn't know much about their lives and schooling back home, and "that started me thinking." One thing she thought about was volunteering with UNICEF in Latin America. She applied jointly with Mia Baxter, an old friend who had been working as a photographer for Glamour magazine. "Our friendship is sort of based on challenging each other," Bush says, grinning, "and I think she was ready to photograph something besides mascara." The pair set out to document the lives of young people who are living in what UNICEF staff members call exclusion, meaning that, for a variety of reasons, they have been marginalized and don't receive basic education, social services, or healthcare. The idea was to vivify the statistics with short, life histories. But after Bush started talking to the young single mother she calls Ana, she got more ambitious. They met at a United Nations-hosted gathering. "She was 17," Bush says, "and she looked so young and fresh-faced." At the same time, there was "an air about her that was so much older." The more Bush learned about Ana's life, the more she thought it was something that should be "brought back to the kids in the United States." "Jenna came to me and said, `I want to write a book about this girl,' " recalls Mark Connolly, UNICEF's regional adviser for HIV/AIDS. After talking to Connolly, Bush called home. Laura Bush, too, encouraged her. Bush and Baxter met with Ana regularly for six months. They cut her hair and talked about boyfriends. Ana called them gringas and made fun of their Spanish. Then, at some point, Bush would get out her tape recorder, and the mood would change. Ana wanted to tell her story - she was "extremely open to us," Baxter says - but it was hard. Ana's mother had died of AIDS when Ana was 3 years old. Ana had only one memory of her: in a bathroom, sobbing. Later, her father died of AIDS, as well. When she was 10, she learned she had been born with HIV. Her grandmother insisted she keep it a secret. There would be other secrets: Ana and her younger sister were sexually abused by a man their grandmother lived with. At Laura Bush's suggestion, Bush and Baxter retained Washington lawyer Robert Barnett, who helped negotiate a contract with HarperCollins. Her share of the profits, Bush says, will go to UNICEF. Some money will go to a fund that will allow Ana to continue her education. 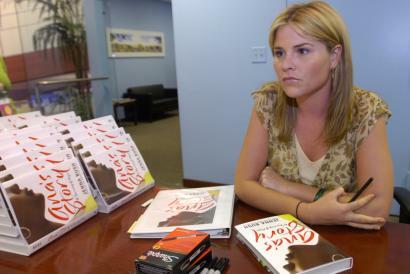 Jenna Bush loses no opportunity to lavish praise on UNICEF and those who work there. Some of that work is in Iraq. UNICEF reported in May that since the 2003 invasion, 4 million Iraqis, "nearly 15 percent of Iraq's total population," have been forced to flee their homes. Half are children. Asked about this, Bush's voice gets quiet. "I definitely, and my father definitely doesn't want war," she says. "But it's a horribly complicated situation." She is not an expert, she says. "But I can say it's devastating. . . . I think everybody can agree on that."